In the name of Fall, here is another delicious pumpkin morsel! Baking just seems like the right thing to do when the temperatures drop, but finding tasty treats of high quality is always the name of the game. When your two year old keeps requesting more, more, more, you know you’ve hit it the sweet spot!! 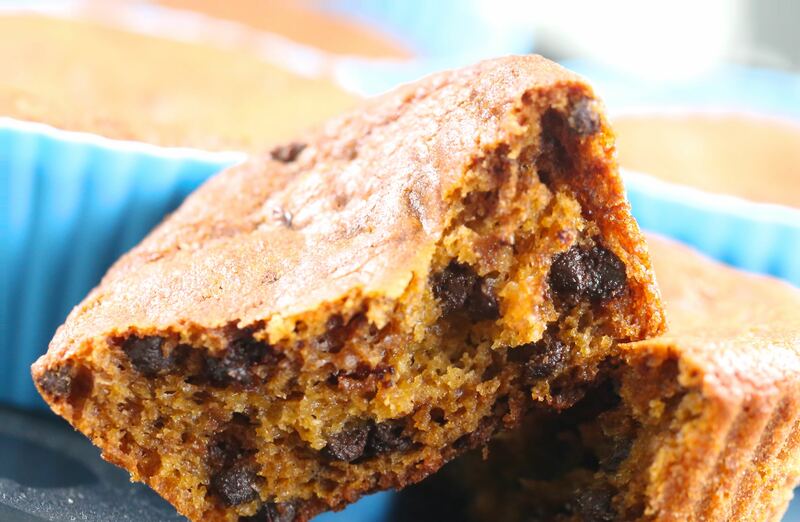 We are enjoying the double batch of chocolate chip pumpkin muffins! I made them yesterday and they are simply divine! Thank you so much for sharing this wonderful recipe! So happy to hear!!! A great recipe for this time of year right? What can I sub the Stevia with???? Thx!! Try the sweetener of your choice, you might need to alter other ingredients accordingly. Have you tried making any baked items like this using Lakanto Monkfruit Sweetner? I only recently learned about it and have yet to try it. Just curious. I have not tried it yet. If there was a good source I sure would try though! Silly question, is arrowroot flour the same as arrowroot starch? Yes or you could use tapioca too!